Definition at line 46 of file llviewerjoint.h. Definition at line 88 of file llviewerjoint.h. Definition at line 114 of file llviewerjoint.h. Definition at line 59 of file llviewerjoint.cpp. References DEFAULT_LOD, FALSE, mComponents, mMinPixelArea, mPickName, LLJoint::mUpdateXform, mValid, mVisible, PN_DEFAULT, SC_AXES, SC_BONE, SC_JOINT, and TRUE. Definition at line 74 of file llviewerjoint.cpp. References DEFAULT_LOD, FALSE, mComponents, mMinPixelArea, mPickName, mValid, PN_DEFAULT, SC_AXES, SC_BONE, and SC_JOINT. Definition at line 88 of file llviewerjoint.cpp. Reimplemented in LLViewerJointMesh, and LLViewerJointShape. Definition at line 340 of file llviewerjoint.cpp. References f, LLJoint::getPosition(), glBegin, glEnd, glMultMatrixf, glPopMatrix, LLMatrix4::mMatrix, LLJoint::mParent, LLVector3::normVec(), NULL, LLMatrix4::setFwdRow(), LLMatrix4::setLeftRow(), and LLMatrix4::setUpRow(). Definition at line 86 of file llviewerjoint.h. Reimplemented in LLViewerJointAttachment, LLViewerJointMesh, and LLViewerJointShape. Definition at line 404 of file llviewerjoint.cpp. Definition at line 507 of file llviewerjoint.cpp. Definition at line 108 of file llviewerjoint.h. Definition at line 125 of file llviewerjoint.h. Definition at line 99 of file llviewerjoint.h. Definition at line 55 of file llviewerjoint.h. Definition at line 81 of file llviewerjoint.h. Definition at line 396 of file llviewerjoint.cpp. Definition at line 242 of file llviewerjoint.cpp. References DEFAULT_LOD, drawShape(), FALSE, glGetBooleanv, gRenderForSelect, isTransparent(), mask, LLJoint::mChildren, MIN_PIXEL_AREA_3PASS_HAIR, mValid, and sDisableLOD. Referenced by LLVOAvatar::renderRigid(), LLVOAvatar::renderSkinned(), and LLVOAvatar::renderTransparent(). Definition at line 121 of file llviewerjoint.cpp. References drawBone(), f, LLJoint::getWorldMatrix(), glBegin, glEnd, glMultMatrixf, glPopMatrix, LLJoint::mChildren, mComponents, SC_AXES, SC_BONE, and SC_JOINT. Definition at line 109 of file llviewerjoint.h. Referenced by LLViewerJointAttachment::calcLOD(), and LLVOAvatar::loadMeshNodes(). Definition at line 124 of file llviewerjoint.h. Definition at line 412 of file llviewerjoint.cpp. Definition at line 96 of file llviewerjoint.cpp. References LLJoint::mChildren, mValid, and TRUE. Referenced by LLVOAvatar::releaseMeshData(), LLViewerJointMesh::updateLOD(), and LLViewerJointAttachment::updateLOD(). Definition at line 517 of file llviewerjoint.cpp. Definition at line 445 of file llviewerjoint.cpp. Definition at line 426 of file llviewerjoint.cpp. Definition at line 464 of file llviewerjoint.cpp. Reimplemented in LLViewerJointAttachment, and LLViewerJointMesh. Definition at line 475 of file llviewerjoint.cpp. References DEFAULT_LOD, FALSE, LLJoint::mChildren, sDisableLOD, and TRUE. Definition at line 532 of file llviewerjoint.cpp. References LLVector3::clearVec(), LLXform::getPosition(), LLJoint::getScale(), LLJoint::mChildren, LLJoint::mJointNum, LLJoint::mName, LLJoint::mParent, LLQuaternion::mQ, LLVector3::mV, LLJoint::mXform, S32, LLVector3::scaleVec(), VW, VX, VY, and VZ. Definition at line 141 of file llviewerjoint.h. Referenced by getSkeletonComponents(), LLViewerJoint(), renderSkeleton(), and setSkeletonComponents(). Definition at line 142 of file llviewerjoint.h. Referenced by getLOD(), LLViewerJoint(), and setLOD(). Definition at line 143 of file llviewerjoint.h. Referenced by getPickName(), LLViewerJoint(), and setPickName(). Definition at line 140 of file llviewerjoint.h. Referenced by LLViewerJointMesh::drawShape(), LLViewerJointMesh::dump(), getValid(), LLViewerJoint(), LLViewerJointAttachment::LLViewerJointAttachment(), LLViewerJointMesh::LLViewerJointMesh(), render(), setValid(), LLViewerJointMesh::updateFaceData(), LLViewerJointMesh::updateFaceSizes(), LLViewerJointMesh::updateGeometry(), LLViewerJointMesh::updateLOD(), and LLViewerJointAttachment::updateLOD(). Definition at line 144 of file llviewerjoint.h. 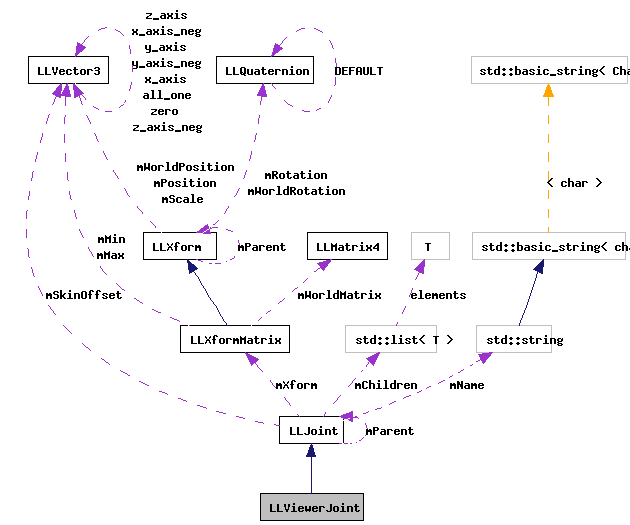 Referenced by LLViewerJointMesh::drawShape(), LLViewerJoint(), and setVisible(). Definition at line 137 of file llviewerjoint.h. Referenced by init_debug_avatar_menu(), render(), and updateLOD().